2019 Summer Camp Registration is OPEN. Click Here! 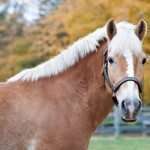 Description: Born in 2006, “Sand Dollar” is a Haflinger mare who stands under 14.2 hands. She is a Palomino with a blaze and unruly blonde hair. Sandy has “a full, rounded figure” and a terrific personality. Personality: When Sandy joined our NCMT family in 2012, it was mutual love at first sight. She is friendly and willing, but has a stubborn streak. Her attention is not always focused where it should be: at times, she prefers to admire the scenery rather than to concentrate on her lesson. She is best friends with her stall neighbor Pearl and will call for her when she can’t see her. History: Sandy came to us from an “A” show trainer in Rhode Island with no show record, but with a big heart and eagerness to learn.